1X/2X - $49.99 Only 3 left! Who doesn't want to be a pilot? You get to drive a machine that can actually fly. There's hundreds of buttons and levers for your entertainment. There's lots of different types of planes (commercial, cargo, military, etc). And of course, you get to fly (did we mention that part already?). Think about it! Flying: the unequivocal freedom of being in the boundless atmosphere, with amazing views, and fast travel. Sounds pretty awesome, right? We thought so too. Only problem is becoming a pilot takes a lot of work. You've got to know what all the buttons do. You have to know how to fly safely (crashes are a bit of a bigger deal on a plane), not to mention the years of training, costs of classes, and somehow getting a job or your own plane so you can actually fly. Not easy. So yeah, we gave up on pipe dreams of becoming pilots ages ago. That doesn't mean we still don't fantasize! And one of the best things about pretending to be a pilot? Those smart little uniforms. 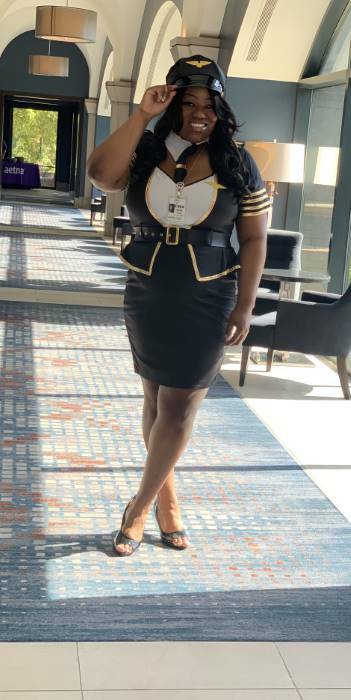 Here we've got our sassy Plus Size Mile High Pilot Costume. It's a little black dress, styled to look like there's a skirt, blouse and jacket. There's even a necktie, a belt, and hat with visor. So even if you're like us and have no clue how to use a plane, at least you can look the part! Super cute, but cut a tad bit small. Loved it though. Got a lot of compliments. I am normally a size 16. This fits perfect not too short, not tight. The material is stretchy and it's comfortable. I feel good in it. I would recommend this to a plus size woman.